1. Not running. Oops, I missed my weekly long run last week. It was just too damn cold, too damn rainy and I was too damn tired to be bothered with it. We are still in the midst of our winter nightmare, with more snow on the way tomorrow afternoon. It just never ends! I think everyone is now crying out for spring to get here. 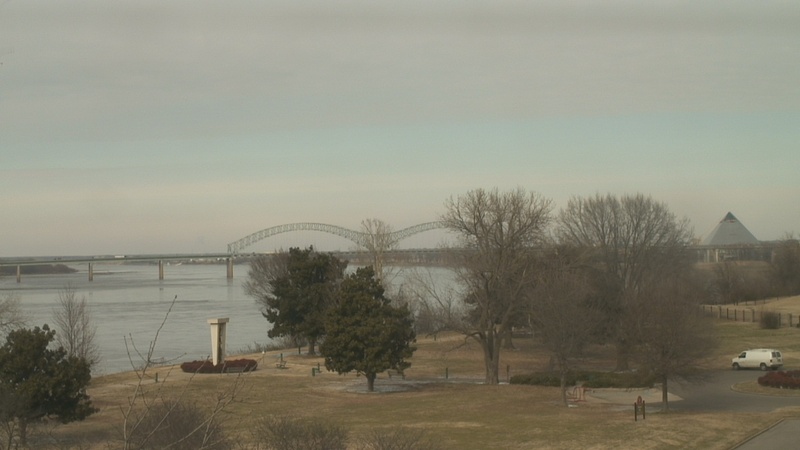 Spring in Memphis is awesome…festivals, patio drinks, patio brunch, walks along the river or the bluff. A willingness to go other places, like midtown or East Memphis. But right now, it’s hard to even leave the apartment! It gets old, fast. So I cover it up, listen to my music or podcast, and check it once in awhile. 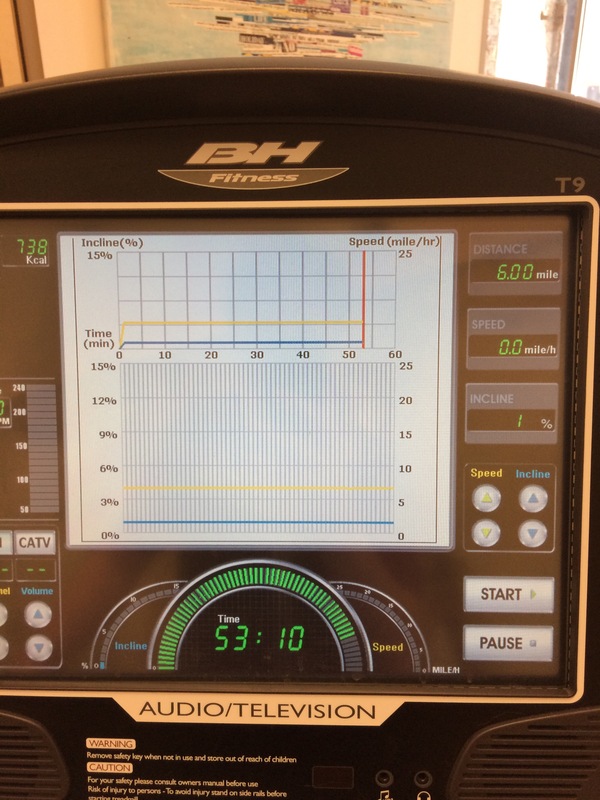 I was going for five miles this morning, and when I went to check, the screen read 4.98. BOOYA! Perfect! Even better, I did it in 43 minutes flat. Not bad! Welcome to Friday! We made it! As I’ve mentioned before, this week has not been a banner one for Memphis weather. Freezing rain, sleet and ice fell throughout Monday, causing schools to be closed the first half of the week. Road conditions were fine on Wednesday and Thursday, good enough to go to work. Another “winter storm” is happening right now, though, so schools were once again cancelled. My drive to work was fine; we seem to be in the Memphis Cone of Silence when it comes to weather. South and north of us is an icy mess, but we seem to be ok for now. Wednesday night’s performance of The Lion King was cancelled, so I’m a bit concerned. By tonight, it should just be raining. OK, who designed this piece of crap? It seems every few days, the Most Recent setting gets moved to another position on the menu. First, why can’t my feed always be set to Most Recent? Why do I have to change it EVERY SINGLE TIME I OPEN THE APP? Further, why doesn’t is show me every update? Let me self-select what I want to read or skip, don’t choose for me. Annoying. 4. The weather part 2. I know, I already talked about this, but I think everyone is totally over being cold and snowed in. From Boston down to the south, it has been absolutely ridiculous! We haven’t been above freezing in several days now, which is about 20 degrees below average. It’s cold, wet, icy and gray. And I hate it. It’s unmovitaving and uninspiring. It’s time for some sun and warmth! I have been searching for a new wallet for months. I’ve been using an old, black leather bifold, but it’s not very stylish and I want something better. Everything seemed the same, until I saw an article in Slate about a different kind of wallet. I placed the order and hope to have it next week, so we shall see. It is very cold outside. It is very icy outside. We got us a bit of a winter storm in Memphis, and so the whole city shut down. Everyone worked from home or had the day off, all schools were cancelled, etc. Last week was pretty bad from a training perspective. Starting Tuesday early morning, my itinerary was MEM-IAH-LAX, LAX-DFW, DFW-IAH-MEM. I probably could have squeezed in one more run on Thursday, but when you’re on the road it’s very hard. I did manage one weekday run, and I ran on Saturday. Wednesday. 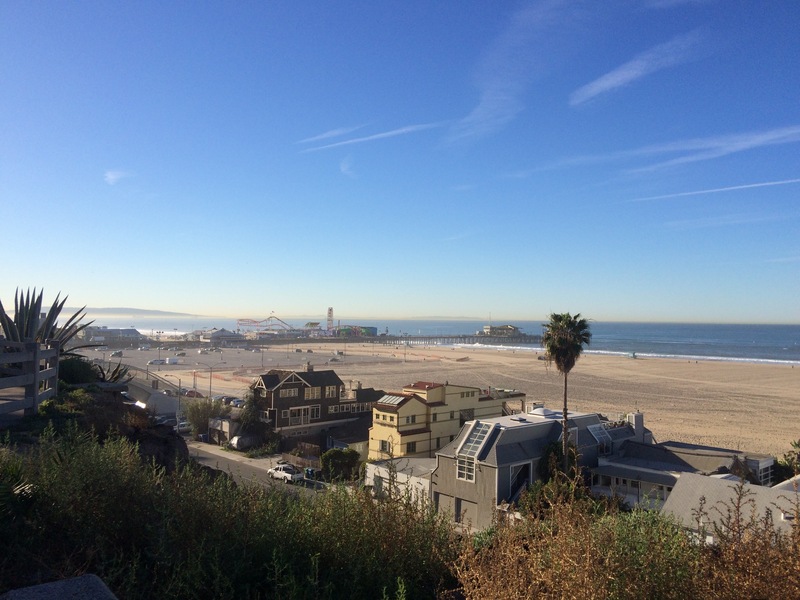 I detailed my Santa Monica run in this post while on my trip. It was awesome, and I loved it and I wish I could do it again every single day. But alas, I’m back in Memphis now. I started off nice and easy, made sure to stay consistent in the middle, and pick it up for the final mile. Sure, that 9:30/mile pace overall is a bit slower than I’d like (I would love to be right at or under 9/mile) it’s not bad considering the low amount of running I’ve done so far this year. I am quite a bit behind the pace for 1k miles, but I’m getting there. Once it warms up and I can run outside more, I can make it up. This week the temperature will not get above freezing until Saturday…at which point it will be 35 degrees and raining. Not ideal conditions, eh? Hopefully during the week I can knock out some quality miles. It’s time to step up those midweek runs back to five miles each. Tuesday started with a flight that was incredibly early. But you know the one good thing about an early flight? Sunrise! It was amazing. 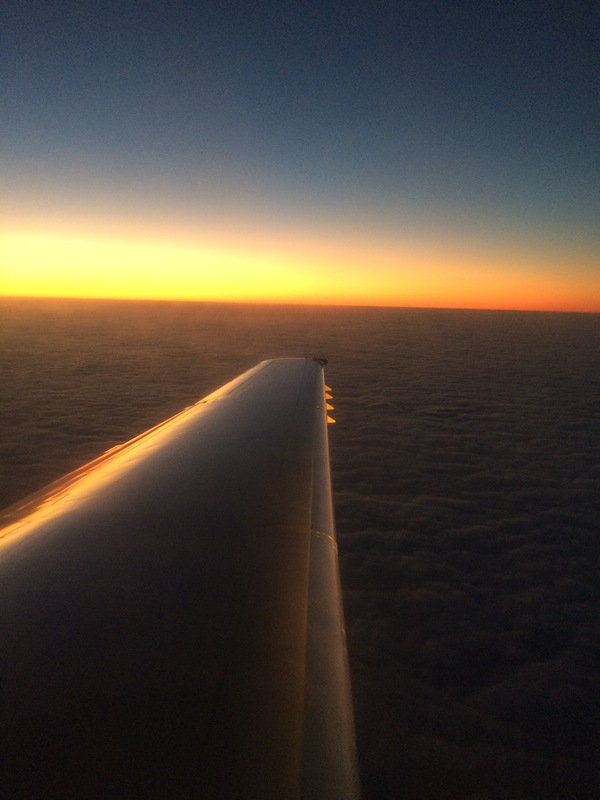 I slept for the first leg but got to catch the sunrise towards the end. Absolutely brilliant. After one more flight, I touched down in LA and went right to work. At the hotel, I received good and bad news. The bad: they were sold out for the night. The good: they were upgrading me to the penthouse floor. Sweet! 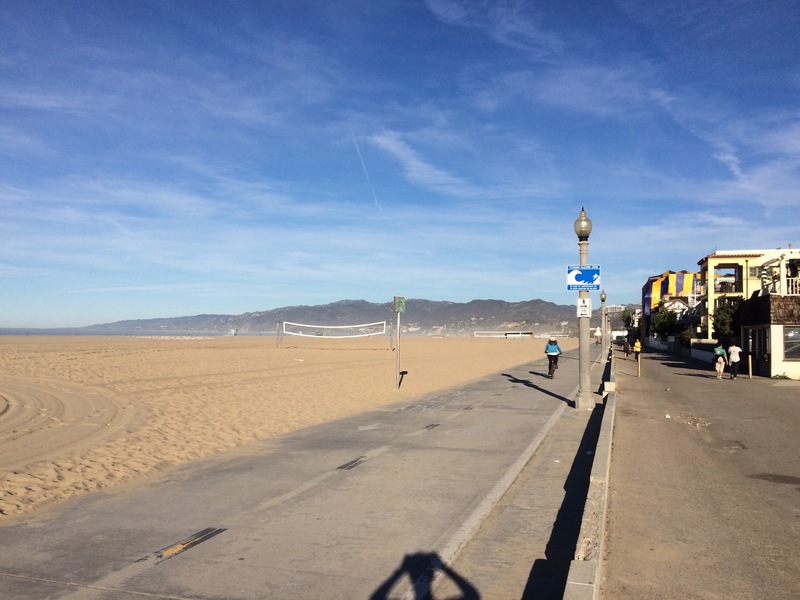 I woke up for an early morning conference call, then headed down Santa Monica Boulevard to run on the beach. Massive photos incoming! Yeah, I think this will do for a five mile run! Damn was it beautiful out: low 70s and sunny, very gentle breeze. 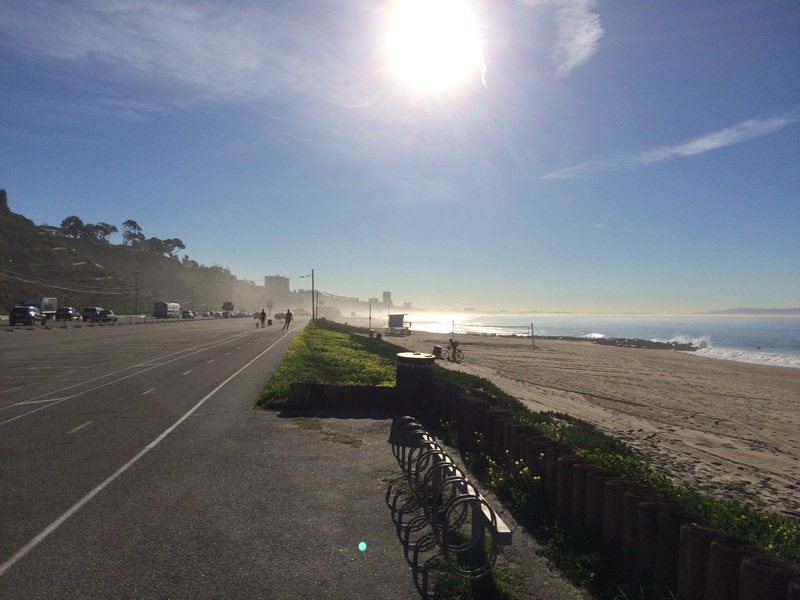 For those that don’t know, Santa Monica State Beach has both jogging/walking paths and a cycling path. At times, they intersect and are shared. I saw lots of runners, walkers, cyclists of all ilks, out enjoying the morning. I came across some sort of fashion shoot. 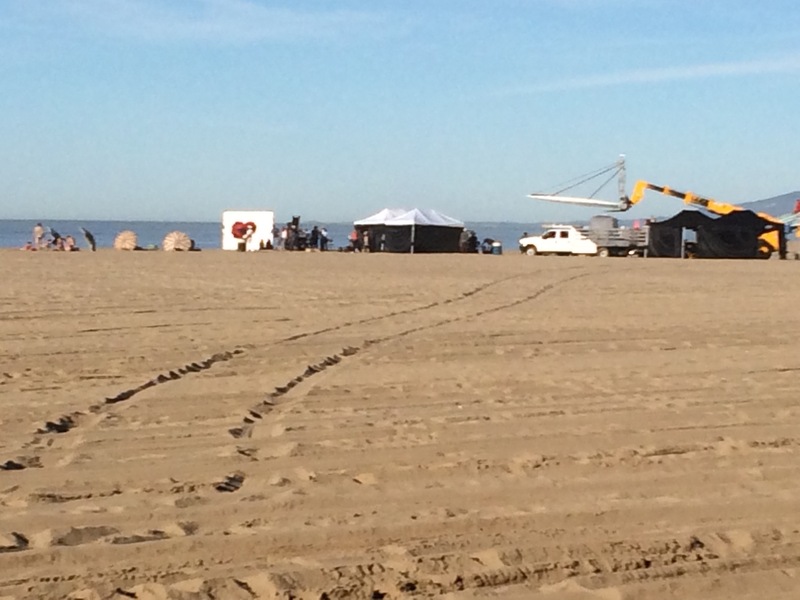 I was hoping Chrissy Tiegen was there, but alas she was not. Sad face. 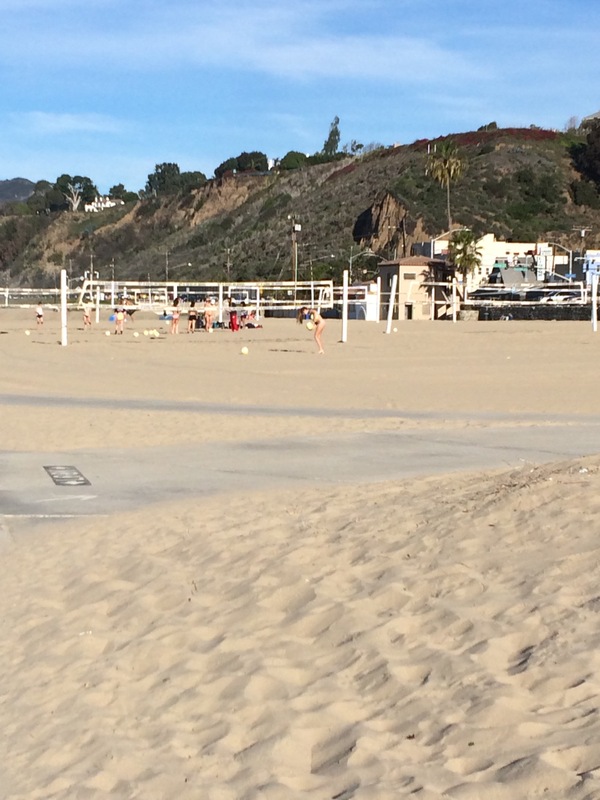 There were also several groups playing/practicing volleyball. This one looked to be a womens team practicing with their coach. When I had gone 2.5 miles, I turned around and headed back. I had the sun in my face and the gentle breeze. I was loving every sweaty minute of it! It felt sooo good! 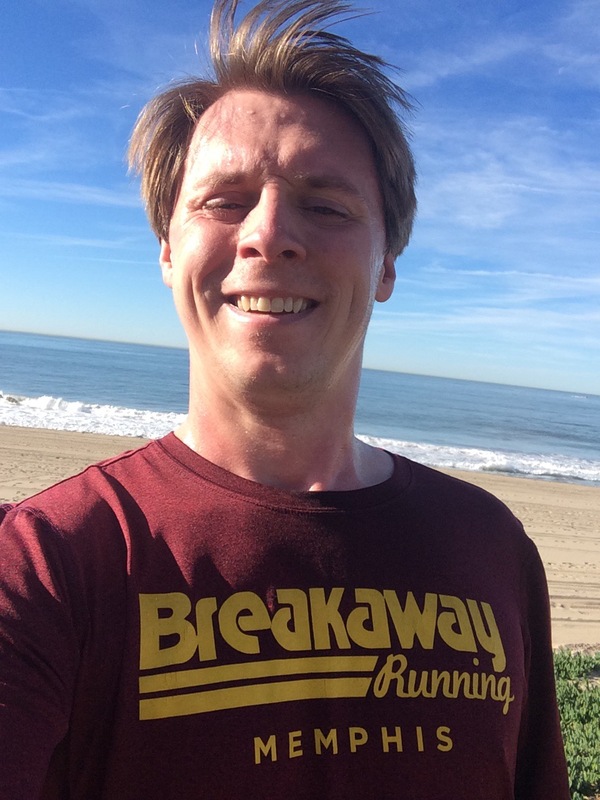 Of course I had to rep my Memphis shirt from Breakaway Running, my local running store. At the end, I finished up a lovely five miler at just under 9/mile pace. I was very tired but happy. My recovery was in two parts. 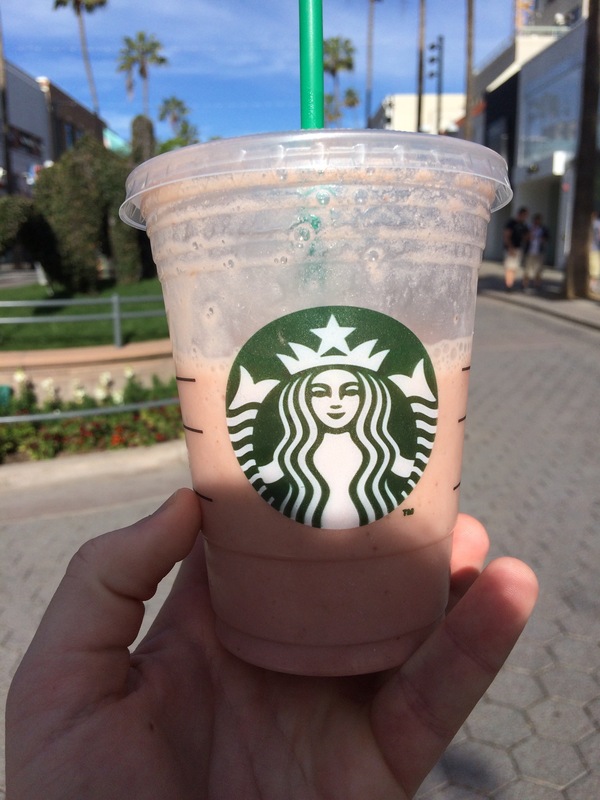 First part was swinging by Starbucks for a strawberry-banana smoothie. I love those things. I may have also had a slice of coffee cake. Definitely. 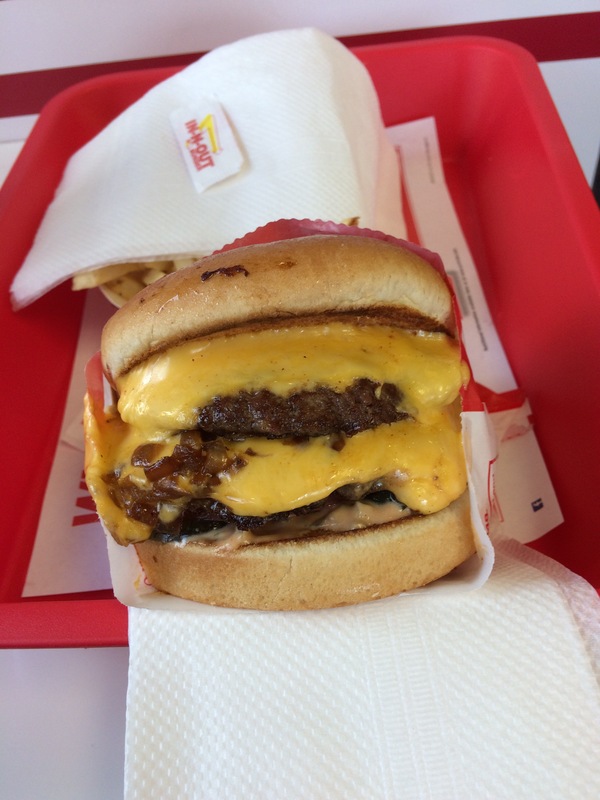 Part Two, after taking a shower and getting cleaned up, was swinging by In-n-Out Burger on my way to the airport. I absolutely love this place and go whenever I can. Evidence: while in San Francisco I walked four miles over the hill just to get a burger. In fact, I’m now in Dallas and I’ve gone to In-N-Out AGAIN already. Since we don’t have it back in Memphis, I take full advantage when I can. So there you have it, my LA run. I can safely say that I understand why people want to live in LA now. Good food, great weather, etc. It was awesome.